There was a time when East Hastings between Cambie and Main would be the hub of activity in Vancouver. With such stores like Woodward's, Golden Crown, Army & Navy (still going strong) and Save-On-Meats occupying the heart of the action, people would make it a point to head to the Downtown Eastside. Then sometime during the late 80's the place began to deteriorate with stores closing one-by-one. In the more recent past, the area is beginning to experience a form of revival, first with the new Woodward Condo development, the opening of Acme Cafe down the street and The Charles Bar. 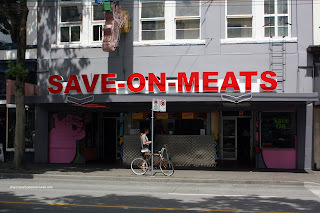 Sadly, last year, Save-On-Meats and its coffee shop closed f or what seemed like forever... until last month. The iconic flying pig is once again lit up in bright neon as Mark Brand (of Boneta) has revived this Vancouver institution. The meat shop is back and so is the coffee shop, albeit with a bigger menu and retro diner look. Milhouse and I took advantage of our proximity to Save-On-Meats after Sunday morning hockey at Brit. Kaiser Soze refused to join us since he considered it too sketchy of an area. And he's Chinese??? We managed to snag a parking spot nearby and without any wait, we got 2 seats at the counter. There was a friendly greeting from the staff despite the bustling activity within the restaurant. Milhouse decided to start with a Vanilla Shake and I wholehearted agreed with him. This was my chance to try it without ordering one myself! It was thick, blended well with hard ice cream and milk. It was a solid shake with real vanilla bean in the ice cream. 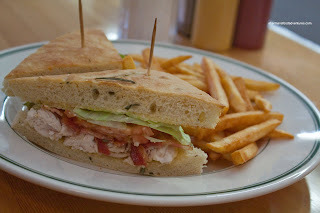 For his main, Milhouse had the Clubhouse consisting of their in-house rotisserie chicken, bacon, tomato and lettuce on focaccia. As much as it is difficult to get excited about a clubhouse sandwich, at the very least, all of the ingredients were fresh. The real chicken meat was plus. As for the fries, they were pretty generic looking and tasting. They were fried perfectly crisp though. For myself, I had to get the Save-On-Meats Burger. For $6.00, it consisted of a bacon cheeseburger and a side of fries. Take that McD's! This was actually a pretty decent burger; but the patty itself was very loose, in a meatball sub kinda way. It was moist though and had a nice char to it. 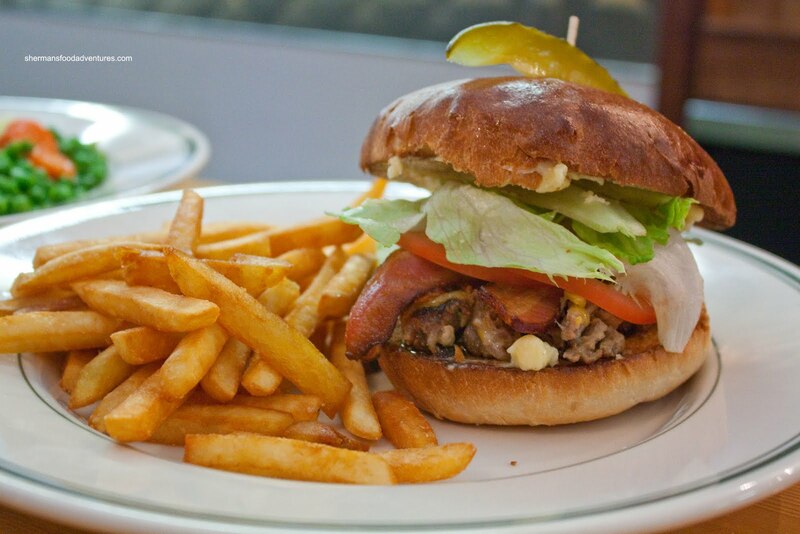 With crisp, thick bacon, cheese and fresh tomatoes and lettuce on a toasted bun, there is not much to complain for the price. However, the 2 dishes didn't seem like a big enough sample size in terms of the food. 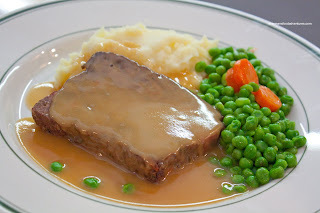 Thus, I also got an order of the Meatloaf. When Milhouse tried a piece, he said there was some taste to it and yes there was. We believe that this meatloaf was a blend of beef, pork and lamb. It was slightly gamy and mostly stiff. It was on the drier side and needed the gravy. I found the gravy to be a little light; yet it did its job. 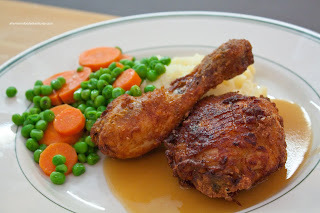 I really liked the buttery mash potatoes and the nicely prepared peas and carrots. As if this wasn't enough already, I also felt the need to try the Fried Chicken. I found the fried batter to be hard rather than crunchy. Furthermore, I felt there wasn't enough seasoning either. It was decently moist inside though. In the end, the food wasn't necessarily the draw here. Don't get me wrong, it was a respectable diner experience. However, I'm pretty sure most people will be nostalgic while loving the quirky location. And with such reasonable prices, there is not a whole lot to complain about. Great review! 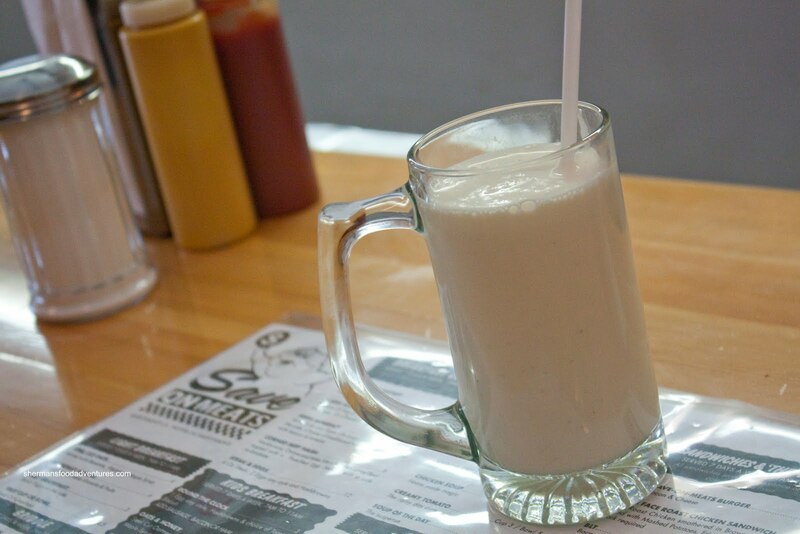 You had me at the milkshake... I loooove vanilla milkshakes. I have to admit the location DOES freak me out though. What's so scary about this location and Hastings? DTES is not as bad as the media portrays it to be, I wish Vancouver-ites and the likes would get this through their head. @munchkie Nah, the location is fine. In fact, that particular area near the Woodward's development is changing.